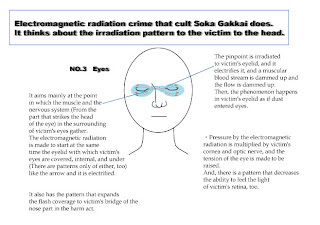 SGI(Soka Gakkai Internati) EMF Crime damage record: Irradiation patterns to eyes to victim due to electromagnetic radiation crime of cult Soka Gakkai. Irradiation patterns to eyes to victim due to electromagnetic radiation crime of cult Soka Gakkai. that cult Soka Gakkai does with the illustration. First of all, please look at the illustration below. Eyes are places frequently irradiated when terrorists of this cult aim at the victim. It was irradiated to victim's eyes by terrorists of this cult, and a lot of victims indicted the pain in Japan last winter. terrorists, the doubt is called. Isn't it a human experimentation? damage of the magnetic substance that is my experience in Japan. The scientist who promotes the terrorism action by using the cult religion upper decides humanity and is not the one to be permitted. I will announce to blog if this scientist's research is observed, and a definite matter is discovered in the future. The topic is returned to the electromagnetic radiation technique of cult. How by the Soka Gakkai believer to aim at victim's eyes has some patterns. The material that radiates the electromagnetic radiation is made to be installed in Soka Gakkai believer's body. This Soka Gakkai believer repeats the movement the vicinity of the victim whom the electromagnetic radiation influences easily and. Other Soka Gakkai believers are repeating a weak electromagnetic radiation irradiation from the outside beforehand. To the part at which the victim is aiming. This is an action to make a big influence easy to receive more the body part of the victim who applied the aim. The believer of Soka Gakkai surrounds the victim, and this is attacked in the group. The victim is shot the maser by the car under the movement, and receives the attack. The attack is surely received if it is a parked car, and there is a believer internally. The remote operation attack is received from the car that gets on no one while stopping. Installation features of the maser of the body are the light parts in ahead and the back. lighting of the inside of a store. Naturally, the shop is a cooperator related to the Soka Gakkai believer or rights. In addition, Soka Gakkai always makes believer's child execute the crime. In this electromagnetic radiation crime, Soka Gakkai is making the little child participate. Soka Gakkai believer's child shoots the electromagnetic radiation into the victim. They are the play senses. Soka Gakkai believer's parents have this crime take the lead and executed. Therefore, Soka Gakkai believer's child doesn't have ethics. Thus, group that makes up criminal who was mind control of young people. It is cult that is called it Soka Gakkai.